Every firm must determine which capital investments can generate profits within a short and extended duration. Capital investment projects can expand business and bring financial growth. Since they require a significant amount of money, a firm has to evaluate if the projects are worth investing in. They, therefore, use different capital budgeting techniques to decide which projects they should invest in. Some of the methods they use to make this evaluation include Net Present Value (NPV), discounted payback period as well as the payback period. Each capital budgeting method comes with some decision rules. Here is more on Net Present value. Before a company invests in a physical project, they can choose this budgeting method. Some of the capital projects that can bring profitability to a company include getting expensive equipment to replace old ones or even setting up a new building. 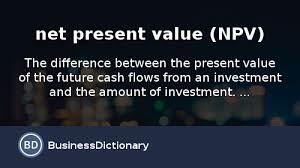 Net present value is a more precise capital budgeting method since it makes use of discounted cash flow during financial analysis. It is a method that puts into consideration both time variables and risk. This type of analysis involves multiple assumptions and variables to determine the profitability of a particular investment. It includes relevant information such as the time span of the company’s project as well as the firm’s cost of capital. A positive NPV indicates the earnings generated by a certain project exceed the anticipated costs of investing in it. If the NPV is positive, the company should invest in the project since it is likely to be profitable. A negative NPV indicates a net loss. A company should, therefore, consider only the capital investments that have positive NPV values and disregard the rest. You can calculate the NPV using spreadsheets, tables and specific calculators known as the NPV calculator. 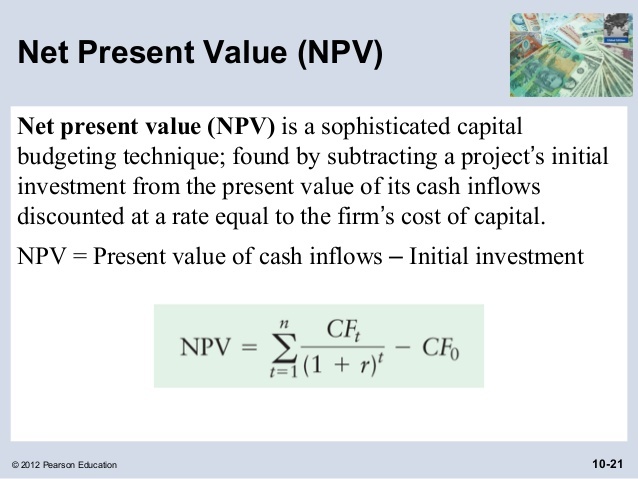 Before using NPV, you should determine the category in which a project lies. While some of the projects are independent, others are mutually exclusive. Independent projects are those that may not have an impact on the cash flows of other company’s projects. Mutually exclusive projects are somehow the same as other projects meaning they may have an impact on the cash flow of similar projects. When a company evaluates more than one capital investment project, they must consider the specific type of projects while calculating the NPV. According to the decision rules of other capital budgeting methods, a company should accept a project that can pay back the initial investment within a specified period. NPV also some decision rules depending on the type of project. For instance, a company should accept an independent project that has an NPV greater than £0. When evaluating mutually exclusive projects, a company should accept the project with a higher positive NPV. Though NPV offers a practical method of quantifying the value of an investment project, it has some limitations. This budgeting method does not quantify for unforeseen expenses that may affect cash flows and costs of a project. A company should, therefore, consider other evaluation methods such as payback period method to analyse investment projects.